THE lawyer heading the defence of former Nissan chairman Carlos Ghosn has been replaced. Motonari Ohtsuru’s office and a statement submitted to court today confirmed Ohtsuru was no longer representing Ghosn. It’s the latest twist in Ghosn’s legal battle after he was arrested in November. He has been charged with falsifying financial reports by under-reporting his compensation, and with breach of trust. Ghosn has repeatedly said he is innocent. It’s unclear if Ohtsuru quit is no longer representing Ghosn or if Ghosn dismissed him. Another lawyer chosen to represent the motor industry star executive also resigned but wasn’t named. 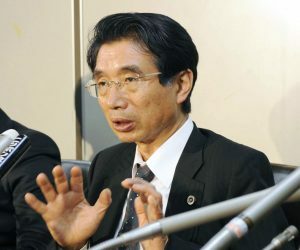 Japanese media said Junichiro Hironaka, a defence lawyer famous for winning acquittals in a legal system where 99 per cent of cases result in conviction, has now been hired to defend Ghosn. It is understood that Ohtsuru – a former star Tokyo prosecutor – and Ghosn seemed to be at odds over his defence, with Ghosn strongly asserting his innocence from the start through his own statements, as well as those of his other lawyers, family members and representatives. He has tried without success to gain release on bail, offering to wear an electronic monitoring tag. Ohtsuru seemed more accepting of Ghosn’s prolonged detention since his arrest on November 19. In a news conference at the Foreign Correspondents’ Club in Tokyo, he said prosecutors might detain Ghosn for many more months. Tokyo District Court, prosecutors and lawyers for Ghosn are scheduled to meet tomorrow to work on preparing for his trial. The news of Ohtsuru’s resignation came the day after Nissan reported a drop in third-quarter profit to about a quarter of the previous year’s, mainly because United States tax reforms had lifted profits a year earlier. It made 70.4 billion yen (circa £493.5m) profit for October to December 2018 – a massive fall from 301.6 billion yen (circa £2.1bn) the previous year. It warned that its annual profit will hit a six-year low and also revealed a charge of $84 million (circa £65.2m) related to deferred compensation for Ghosn. Also today, the Renault board unanimously decided that following Ghosn’s resignation as chairman and chief executive last month it would waive his commitment not to compete with the manufacturer. As a result, it will not be paying him the corresponding compensation, the sum of which was not disclosed, although it said it equalled two years’ fixed and variable compensation. In addition, since he is no longer with Renault, Ghosn has lost his right to various shares granted to him in 2015, 2016, 2017 and 2018. The board also said that it would decide on his remuneration for the 2018 financial year on March 15.